The blossoming of neelakunrinji in the Munnar hills has been an occasion for celebration for nature lovers and artists alike. Many have already been there and many more are planning to visit the hills in Munnar to savour the feast that nature has prepared for the eyes. The creative artists have responded in their own fashion to capture in their favourite medium the delightful spectacle. The splendour of the strobilanthus shrub that put out neelakurinji once in 12 years has also drawn filmmakers from across the world to Munnar, where the flowers have laid out a blue carpet on the hillsides and ravines. The blossoming of the flowers has presented Rajan Chungath, who has made several documentaries on a wide range of subjects, with a colourful theme for another film. His docu-film is titled Devaswapnathinde Azhakil Oru Neelakurinji Kakam. Chungath's 23-minute documentary will be launched for screening by Forest Minister Benoy Viswom at Kannadikkal GLP School auditorium in Kozhikode at 6.30 p.m. on October 31. 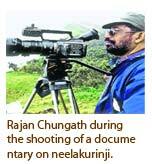 Rajan Chungath, who besides directing the film also wrote its script, said about shooting the documentary in Munnar: "It is sad these lovely blossoms have a short life span of just three months. By November and December the flowers will be gone.
" It is going to be a long wait of 12 long years before the flowers bloom in Munnar hills once again. We can only pray the Munnar's hills will continue to be an ideal habitat for these flowers 12 years from also." The film, produced by Chandrakanth Vision, Edappal, besides capturing the splendour of the flowers also throws light on its history, environmental problems in Munnar, declaration of the hills as "kurinji sanctuary" and rendering of poems on neelakurinji by Sugathakumari and Tamil poet Serpi Balasubramaniam in the backdrop of the blue carpet prepared by the flowers in Munnar. 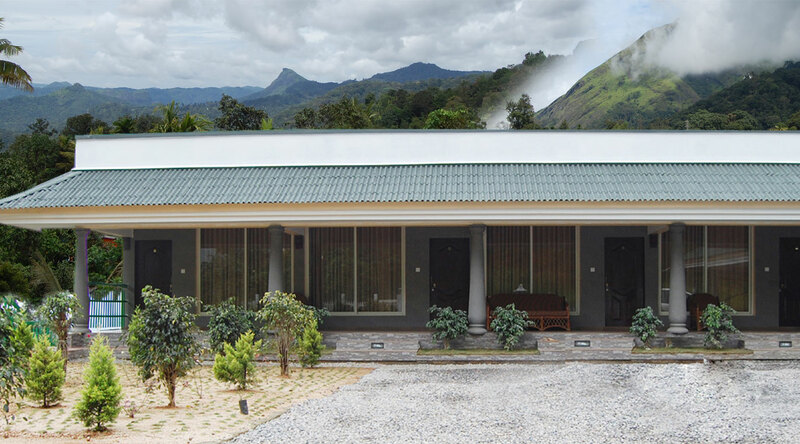 Kochi: Till last year anybody and everybody who came to Munnar, set at an altitude of 6,000ft in Idukki district in Kerala, could make it to the nearby rolling grasslands of Eravikulam National Park, home to the endangered mountain goats Nilgiri Tahr. The long queue of vehicles often led to a traffic jam and created much environmental pollution. But one can't do this any more. If one wants to take a peek at the mountain goats nibbling grass at Rajamala, part of the national park draped in clouds, one has to follow a code of discipline that the local tribes people and forest officials have introduced. The tribes people, who have formed the eco-development committee (EDC), are now earning between Rs4,250 and Rs4,500 every month and spreading the message of conservation. The trigger for the initiative was the massive tourist inflow when 'neelakurinji'—the blue flowers that bloom once in 12 years—blossomed in April 2006. The forest officials then introduced the systematic visitor management programme limiting the number of vehicles to conserve energy. It also set up its own fleet of vehicles to ferry tourists. The Forest Development Agency (FDA), a co-operative of over 2,100 tribes people, was born with Roy P. Thomas, wildlife warden of Eravikulam Wildlife Sanctuary as the member secretary and CEO and P. Bennychan, field director of Periyar Tiger Reserve at Thekkady, as its chairman. 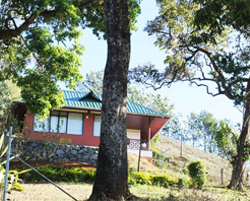 Different eco-development committees across Munnar were brought under the FDA. With financing from the State Bank of Travancore, six mini-buses were purchased that ferry tourists charging Rs20 per visitor. The blooming of the neelakurinji (strobilanthes kunthianum) last year drew over 4,50,000 visitors and in 10 months the seven-year maturity loan was cleared. Now the FDA owns all the six buses. 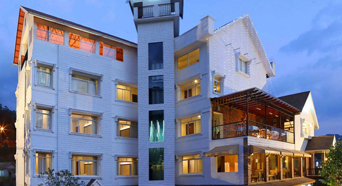 With an asset base of over Rs3 crore, this agency ploughs back its profit for the development of the community. This year, Rs10 lakh has been set aside for the development of 20 hamlets of tribes people. "The forest department is taking pains to make our lives better," says Tami, a tribesperson. "It is a small effort at teaching the people that they are capable of empowering themselves and their contribution to conservation is no small job," adds Roy. "Even now, at the peak of this monsoon, we have 500 to 1,000 visitors daily," says K. Karuppasami, who had been plying private vehicles for seven years at Munnar. V. Manikandan and T. Anandaraj, two of his neighbours who have sold their jeeps that used to ferry tourists before the mini-buses took to the roads, have no regret. "We are not mere drivers anymore. We have been given special training by the forest officials in conservation," says Manikandan. The tribes people now run an eco-shop, where besides refreshments, they also sell eco-friendly products spreading the message of conservation. Among the products sold are souvenirs, t-shirts and greeting cards. 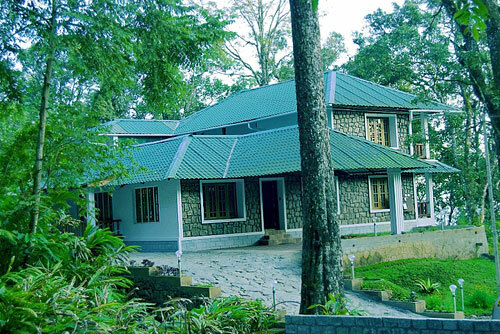 A few more such eco-shops are to come up at important tourism spots across Munnar, says Roy. The forest department is also setting up small huts at various vantage points for the tourists and some of them will become functional when the tourism season kicks off at the end of monsoon. These will be owned and run by different eco-development committees of the area under FDA.